So the child grew up fearless. Often she spent her nights wandering on the high moors with a stick of yew in her hand, calling the owls, who would whirr down in a soft blur of feathers and clutch her arm, turning their black brilliant eyes here and there. But as sunrise streaked the sky she would be back at the cottage to blow the fire aflame and put the kettle on the hob and kiss her grandmother awake. Then her grandmother died and was buried. After the funeral, the young girl sat alone in the cold cottage and cried. “Grandmother, where have you gone? Why have you left me? 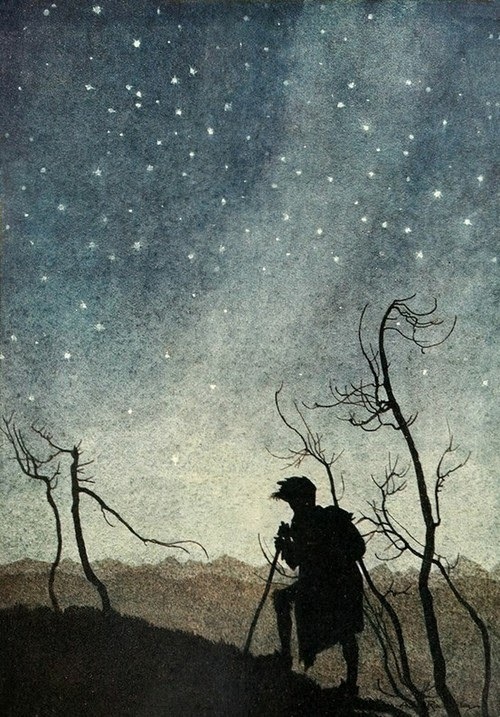 How can I find you?” And each night she wandered further and further afield, following the bright beckoning of the North Star, axle of the sky, till she came to the country where it is always dark and day is no more than winter twilight, even at noon. Underfoot was heather, and black bilberries, and withered bracken. One night she came over a ridge and saw a lake lying beneath her. Its waters were still and dark and very cold, and it lapped a shore of granite pebbles that glinted in the starlight. And, straining her eyes, she thought she saw the dim loom of an island far out in the lake, and at once she was overcome with longing to set foot on it, but there were no boats on the shore, and the water was too cold to enter. It would have frozen her heart. And it seemed the North Star shone directly over the island, tugging her towards it. Three times the stars wheeled overhead as she walked along the shore, watching the dark shape of the island sleeping on the water, and in all this time she saw no more than a quick meteor threading the high heaven, and heard no more than the crunch of her own footsteps and the knock of her staff striking the shingle. The old man set her to pick up all of the glowing pebbles and heap them near the coracle. Under the turning sky the girl went back and forth, collecting the stones till her hands were cold and bruised, but although the pile grew higher and higher, the old man was never satisfied. Soon all the shingle close by was dull, while the pile beside the coracle shone like a white beacon. She was so stiff she wondered if she would ever be able to straighten up again, but still she had to go to and fro, and each time she asked for the coracle, the old man shook his head. “Not yet, not yet,” said the old man, groping in the heap. “Row me over,” the girl demanded, throwing the jewel down. 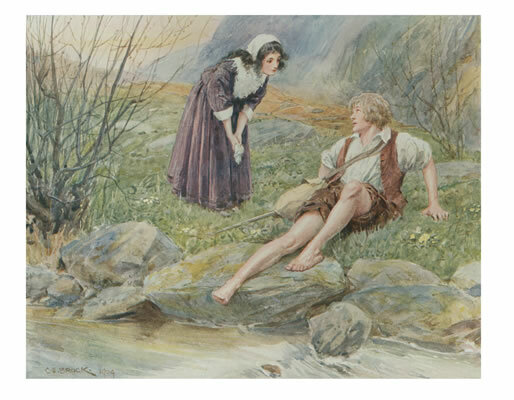 But because the old man moaned and clutched at his dead heap she lowered her stick, saying, “You would do better as an honest fisherman, I think,” and dragged the coracle into the water, which lapped her foot and seeped into her shoe, so cold that she gasped. She climbed in and poled off with her stick, then took up the paddle and began to make her way towards the darkness that lay on the centre of the water, just showing an island’s shape against the star-prickled sky. The leather sides of the coracle were cracked and dry, and the cold water welled in so that she had to stop paddling and bail with cupped hands till they stung and ached with cold. At last the leather swelled with the moisture and the cracks were closed. Then she picked up the paddle and went on. Slowly the island drew nearer, and larger, until she was working into a little bay where small, gnarled trees grew right against the water and leaned out above it. She grasped their branches and pulled herself out of the boat, and they shook bitter bark down into her face and hair, and her fingers were sticky with resin. Slowly she hobbled inland with bent back and frozen hands, and she blundered in the darkness, for gall and bark were stinging her eyes. But she dragged herself uphill, tearing her skin on brambles, till she reached a high mound in the centre of the island, free from trees and bushes, covered with short, dry grass. At the top of the mound she drove her staff into the turf and sat down beneath it and wept in the cold air, and the tears washed the bark from her eyes and splashed warm on her hands, watering the ground with salt. And when she looked up there was the north star, straight overhead, brighter than she had ever seen it. And the stick at her back rooted, and put out dark leaves and small white flowers. This is something I've always wanted to share with you. It's a piece called 'Photography Extraordinary' written by Lewis Carroll for one of the home-made family newspapers he wrote and illustrated, The Rectory Umbrella and Mischmasch. 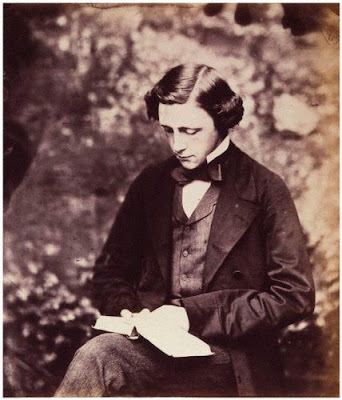 It was published in the Illustrated News of Jan 28 1860, five years before the publication of Alice’s Adventures in Wonderland - when Carroll was twenty-eight. The recent extraordinary discovery in Photography, as applied to the operations of the mind, has reduced the art of novel-writing to the merest mechanical labour. We have kindly been permitted by the artist to be present during one of his experiments. The operator began by stating that the ideas of the feeblest intellect, when once received on properly prepared paper, could be ‘developed’ up the highest intensity. He … summoned a young man from an adjoining room, who appeared to be of the very weakest possible physical and mental powers. … The machine being in position and a mesmeric rapport established between the mind of the patient and the object glass … [he] at once commenced the operation. ‘Alas! She would not hear my prayer! Disfigured, I should be less fair. ‘Well! so my offer was no go! She was a fool to answer ‘No’. We returned this with the strongest expression of admiration, and requested it might now be developed to the highest possible degree. Our friend readily consented, and shortly presented us with the result, which he informed us belonged to the Spasmodic or German School. We perused it with indescribable sensations of surprise and delight. ‘Firebrands and daggers! hope hath fled! To atoms dash the double dead! My brain is fire – my heart is lead! Her soul is flint – and what am I? Our friend concluded with various minor experiments, such as working up a passage of Wordsworth into strong, sterling poetry: the same experiment was tried on a passage of Byron, at our request, but the paper came out scorched and blistered by the fiery epithets thus produced. Some time ago, out of interest, I pulled a list of ‘Children’s Classics’ off Wikipedia. There were 66 titles, and Aesop’s Fables headed the list with William Caxton’s edition of 1484. Apart from a couple of obscure titles - at least, I have never heard of ‘A Token for Children’ by James Janeway, and ‘A Pretty Little Pocket Book’ by John Newbery - I can hand on heart say that I encountered most of them during my own childhood. 'Robinson Crusoe’, ‘Ivanhoe’, ‘The Swiss Family Robinson’, ‘The Coral Island’, ‘Journey to The Centre of the Earth’, ‘Uncle Remus’,‘Black Beauty’, ‘Treasure Island’, ‘The Happy Prince’. Tick, tick, tick. And so on. 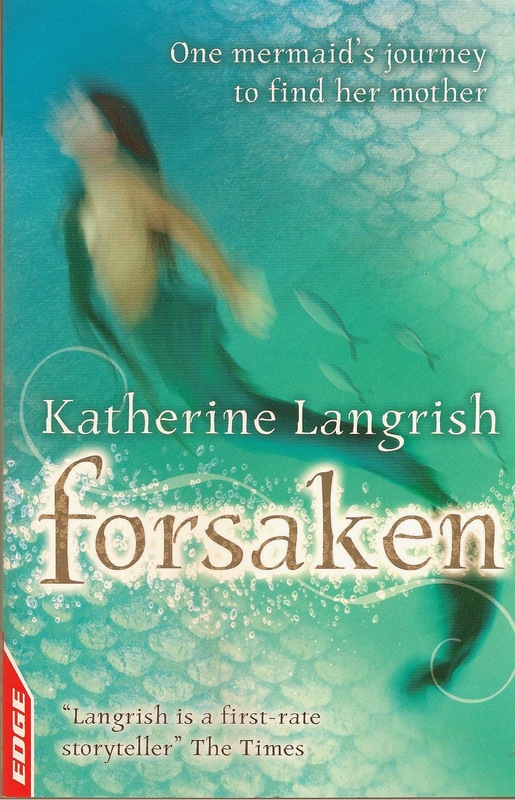 What strikes me now is the extreme scarcity of heroines in these books. Fairytales apart, there are only 12 stories out of the entire 66 in which the main character is female: they are ‘Little Goody Twoshoes’ (1765), ‘Alice’s Adventures in Wonderland’ (1865) and ‘Through the Looking Glass’ (1871), ‘Little Women’ (1868), ‘What Katy Did’ (1873), ‘Heidi’ (1884), ‘The Wonderful Wizard of Oz’ (1900), ‘Rebecca of Sunnybrook Farm’ (1903), ‘Pollyanna’ (1913), ‘A Little Princess’ (1905), ‘Anne of Green Gables’ (1908), and perhaps Mary Lennox of ‘The Secret Garden’. There are some deceptive titles which sound as though they are going to be about heroines, such as ‘Lorna Doone’ (1869) and ‘The Princess and the Goblin’ (1871) but these are really more about the male protagonists, John Ridd and Curdie. Even though the last book on the list was published in 1918, many – in fact most – of these titles formed part of my reading a full half century later. As a child growing up in the sixties, I can’t say I consciously noticed the absence of strong female characters, since naturally I identified with the hero, whoever he might be. I swam lagoons with Jack, Ralph and Peterkin, roistered and swashbuckled with D’Artagnan, escaped across the heather with Alan Breck, roamed the jungle with Mowgli – but I did notice the rare occasions when the main character was a strong heroine. This, I think, is why so many of us loved – loved – Katy Carr, Jo March and Anne of Green Gables. 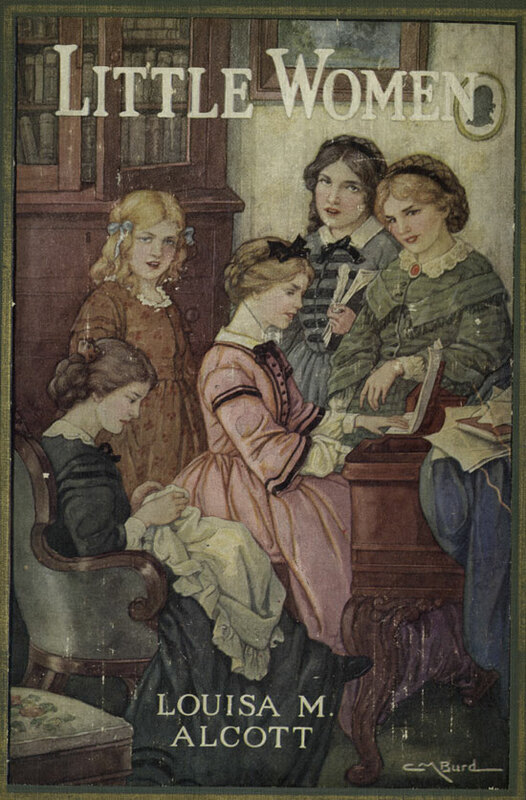 We were resigned to encountering girly girls in books. And by girly girls, I mean girls filtered though a conservatice male imagination. 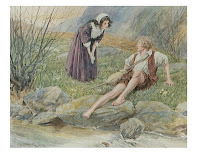 Girls who needed to be rescued, who swooned on manly breasts, like Lorna Doone. 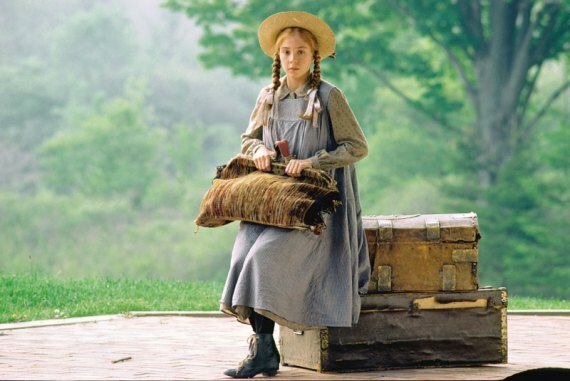 Girls who were sweetly domestic, decorative, helpless and good like David Copperfield’s Dora. Girls who were ill-treated victims like Sara Crewe. Or else girls who simply were not there at all. It was a literary world in which boys were allowed to be Peter Pan but girls were condemned to be Wendy. …Katy’s unlucky star put it into her head to invent a new game, which she called the Game of Rivers. It was played in the following manner: - each girl took the name of a river and laid out for herself an appointed path through the room, winding among the desks and benches, and making a low roaring sound, to imitate the noise of water. Cecy was the Plate; Marianne Brooks, a tall girl, the Mississippi; Alice Blair, the Ohio; Clover, the Penobscot, and so on. They were instructed to run into each other once in a while because, as Katy said, ‘rivers do’. As for Katy herself, she was ‘Father Ocean’, and, growling horribly, raged up and down the platform where Mrs Knight usually sat. Every now and then… she would suddenly cry out, ‘Now for a meeting of the waters!’ whereupon all the rivers bouncing, bounding, scrambling, screaming, would turn and run towards Father Ocean, while he roared louder than all of them put together, and made short rushes up and down, to represent the movement of waves on a beach. Such girls seemed to be going places. The trouble was that there wasn’t really anyplace for them to go. I don’t know why the imaginations of the women who created them could come up with so few goals in an era that was producing strong women by the bucketload: in the States, the early suffragists like Susan B. Anthony and Elizabeth Cady Stanton; in Britain reformers like Florence Nightingale, Josephine Butler, the Pankhursts. Writing and teaching figured largely. Anne of Green Gables becomes Anne of Ingleside, a teacher, marries Gilbert Blythe and has children. Jo marries Professor Bhaer not Laurie (this we could hardly forgive, though it may be more realistic! ); she does become a writer, but then goes all matriarchal and nurturing and 'womanly'. Katy travels to Europe and marries a young naval officer who is attracted to her because of her – wait for it – selfless nursing skills. No one becomes a doctor or a politician or a reformer. 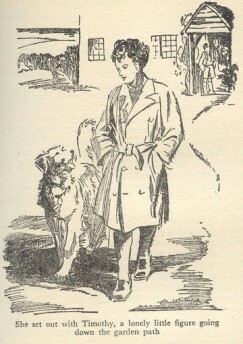 In Enid Blyton’s ‘Famous Five’, how I and my schoolfriends identified with the tomboy George, who cut her curly hair, wore shorts, owned a dog, told the truth at all costs and was brave and passionate. How much better she was than sissy Anne (who wore a plaid skirt and a hairslide)! And yet, and yet – that cry of hers, “I’m as good as a boy any day” – is the very mark of inequality. Why should a girl have to masquerade as a boy to be taken seriously? Why should bravery, independence and action be seen as masculine qualities? We shouldn’t be complacent. 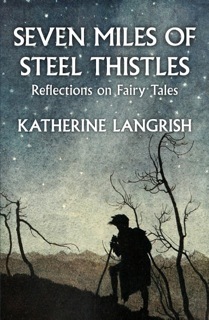 I can think of plenty of independent, strong heroines in modern children’s fiction – Joan Aiken’s Dido Twite would come top of my personal list, and Harriet of ‘Harriet the Spy’, Lyra in ‘The Golden Compass', and Garth Nix's gallant Sabriel and Lirael. These girls aren’t trying to prove that they are as good as or better than boys. They simply get on with life and grapple with its problems. But there are many books for teenagers in which the heroines need – rely on – yearn for – the strong arms and love of some idealised boy. Compare Bella of 'Twilight' to Katy Carr or Jo March. It's hard to imagine either of them languishing after 'perfect' Edward. Of all the girls in all the titles on this list of classic books for children, the most independent of all is Lewis Carroll’s Alice, who calmly steers her way through the looking glass wonderlands of her own imagination. Alice never feels in the least inferior to any male character. She stands up for herself in her own very feminine way, experimenting, chopping logic, lecturing herself and others, refusing to be snubbed, insulted or put in her place. At the end of each book when her imaginary world threatens her, she pulls it down about her ears like Samson pulling down the pillars of the temple in Gaza. She is extraordinary – and the creation of a man. But she is pre-adolescent: what does the world really hold for ‘alices when they are jung and easily freudened’? Carroll’s Alice touches a kind of bedrock: a certainty of self-worth that may be felt by many little girls in stable and happy families – but which is still all too easily lost as the teens commence.